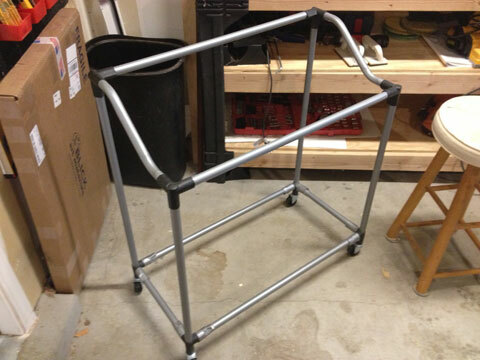 Since I can’t sleep because I am hacking up junk (the antibiotics are working – just not fast enough) I may as well be productive and finish the posting about the laundry cart I made for my wife. I actually finished this weeks ago, but with Quigley and all I didn’t really feel like posting about it. Last time we checked in I had all the side panels glued up, stained and ready to be given a coat of polyurethane varnish. I decided to go with a polyurethane because it is a very durable coating that isn’t going to wear off very quickly so the piece will be protected for a good long time, and since this is a laundry cart that is being used daily, that is a very good thing. When I did the varnish, I used a good, fine bristle brush so I was able to put down a good coat without having too much left on the surface to cause drips or pooling. After letting one side dry for 24 hours, I then flipped them all over and poly coated the other sides. I gave the cart a total of five coats and in between each coat I ran over it lightly with #400 sandpaper to smooth out the brush strokes. Once the last coat was dry I gave it a good buffing with some 000 steel wool and furniture wax. The steel wool, like the sandpaper, allowed me to remove any debris that might have settled into the varnish while it was wet and also remove the brush marks while the wax made sure the steel wool didn’t cut too deep or leave any visible scratches. The result was a nice warm glow to the wood without looking too shiny. 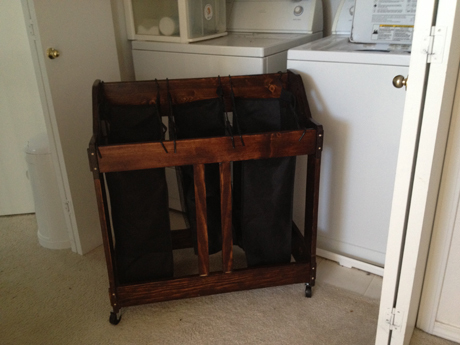 So, behold the power of this fully operational laundry cart! The white dots on the top and bottom rails are where I drilled though and then used dowel rods to pin the pieces together, that way the wood can still flex with the changes in weather and the only glued spots are where the dowels are held in place. I like the contrast so I didn’t bother to stain it. Wheels and hampers were salvaged from the old cart and work perfectly here, and this frame can hold quite a bit more than the old one could too, so no worries about three full bags and then piling blankets on top too. So, let’s review – above, new hotness; below, old and busted. 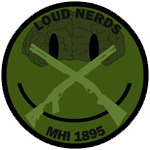 I think I see an improvement over the original. Actually, what I am feeling is a fever. Workout is on hold, wind chimes are on hold, grips are on hold. Here’s this for you instead. Thanks for the emails and comments, got into see the doc today and I have done a trifecta of infections, namely – ear infection, sinus infection, and the crown jewel – PINK EYE! Now I’m going to take some drugs and go quietly die somewhere. Things are slowly getting back to normal around here. I had to change out all the litter in the boxes and scrub them down to make sure there’s nothing lingering to hit the other cats. 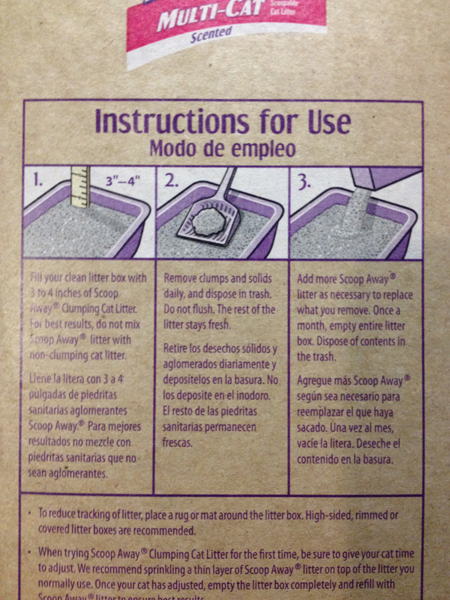 While I was doing this I noticed there are instructions on the litter box. Yep, dirt and clay require instructions. Really??? If you actually need those directions, I’m thinking that maybe pet ownership is beyond your skill set. Even looking at it in writing it still doesn’t seem real. Those words don’t go together. Quigley was supposed to stick around for the next 18 years and be my son’s best buddy. They started it all together, but now he’s gone and it’s just not fair. Then again, I am fond of saying that ‘fair’ is a place with rides, cotton candy and animal poop. Matthew has lost his best friend in the world. As I left to take Quigley to the vet, Matthew and Quigley had one last headbutt. I cried as I drove. Quigley had FIP. The vet told me that it comes on fast and there is no cure. From Thursday when we notices some swelling in his abdomen to tonight when I took him in his breathing had become labored, he was in pain, and even just laying on his blanket was wearing him out. He came into our lives the same way that Matthew did, and unexpected surprise that became a total joy. He showed up on our doorstep and just invited himself to stay, literally. I had taken the trash out on a Thursday night when I saw him next to our bin, hiding in the shadows. He apparently saw a good mark because he came over and began rubbing against my leg. He was thin, bony and very much in need of some food and water. As I tried to go inside to get some for him he ran into the house, jumped up on the sofa and looked at me like “Oh, your home. Nice to see you again.” I’d like to say that I decided right then and there to keep him, but I hadn’t. 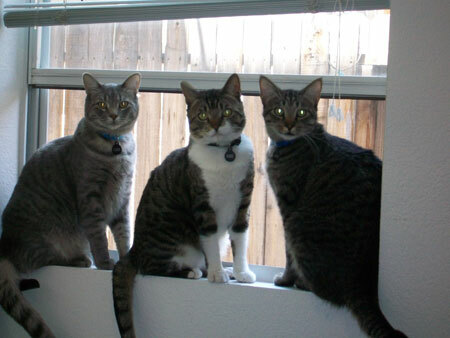 We already had four cats and I really didn’t want a fifth one. It was the when he made himself best friends with Matthew that I knew we couldn’t get rid of him. 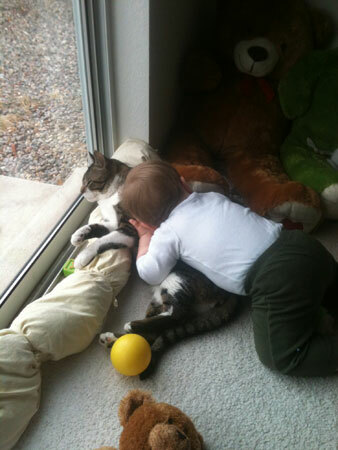 He had already become best pals with our other boys, Zane and Cooper, but when Matthew would use him as a pillow, or sit with Matthew looking out the back window for as long as Matthew wanted that I knew we had another member of the family. If there was a cat version of Cool Hand Luke, it was Quigley. He really was a cool cat. The only one I know that would eat peas, carrots and green beans. If Matthew ate it, so would Quigley. He would nap wherever he wanted, floor, window, chair. If he decided it was time for a nap, wherever he was would be the perfect spot for it. I held him while they put the IV in. I could feel him struggling to breath but I kept thinking to myself “Am I doing the right thing?” What if I was wrong? What if the vet was wrong and somehow he could be healed and come back to us the happy, healthy tough guy that I loved? Even as I asked myself this I knew it was just the faint voice of hope that makes us hesitate from doing what we know we must, because it is painful. Releasing him so that he could be free of his pain hurt me, but what kind of person would I be to make him suffer more so that I could suffer less? With the last injection he was gone. And I cried. I’m crying as I type this. I feel guilty even though I did everything I could. He was my responsibility and I failed him. As I set him down all I could do was say “I’m sorry” over and over. And I am sorry. I’m sorry for the loss of a friend, and I’m sorry that he won’t get to grow up with my son. Mostly though, I am sorry for me, because I miss him. 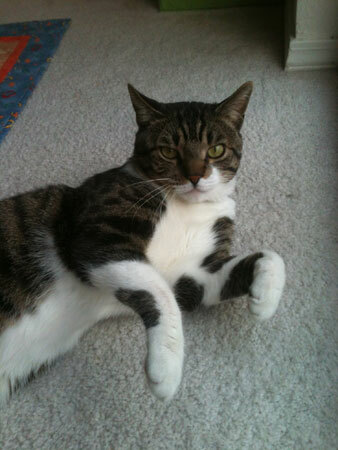 God bless you Quigley, he’s called home a very cool cat. He’s not been acting like himself of late, he’s pretty mellow and likes to hang out in the sun, but we noticed last week that it seemed more like he was weak than just resting, so we took him to the vet hoping it was something simple like an infection or something like that. First prognosis was pancreititis, which in cats is a lot like it is in humans, an inflammation of the pancreas that is very painful and results in loss of appetite and lethargy. We left him with the vet for two days so they could do some tests, get him re-hydrated and get some meds in him to help. During those two days he was gone Matthew was inconsolable. Quigley is his best buddy in the world. They hang out together all the time, watch TV, sleep, you name it and the two of them will be doing it together. So, with Quigley gone there was a very upset two year old who wanted his buddy back NOW! We finally were able to go and get him on Wednesday. Matthew and the wife went down and went in the vets holding area to bring Quigley home and it was a meeting of best friends. A very tired and sleepy Matthew gave his best buddy a hug and a kiss, talked to him the whole time Quigley was in the crate on the ride home, and then tried to feed him by hand once they were back. Well, the vet wanted a follow up today and while I have noticed Quigley isn’t as lethargic as he was before, he is certainly not back to his old self. The vet drew more blood, I took him home and about an hour later we got a call. The vet isn’t happy with the progress and wants to see him again on Monday. She’s afraid that it may actually be lymphoma. If it is we have no way of paying for treatment and Matthew will lose his very best friend. 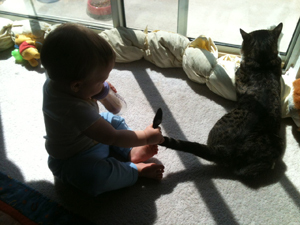 Please keep a prayer in mind for my son and his cat.